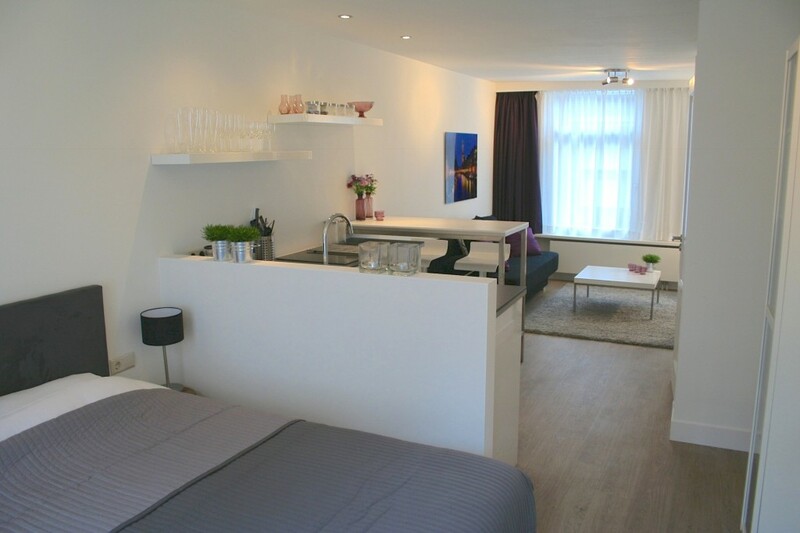 Rosies Place is a completely renovated studio apartment with a luxurious look and feel, especially designed for people who want to have a nice holiday break in Amsterdam. Rosies Place is situated right in the city center of Amsterdam, within the so-called canal ring. Our house is tucked away in a small quiet street of the Jordaan. Around the corner you will find restaurants, bars, shops, galleries, markets and lot’s more. Also the museums are close by. Even closer is the Anne Frank House. Rosies Place is on the first floor of our house, accessible by a steep staircase. It’s more than suitable for 2/3 adults or 2 adults with 2 small children. It has a king size bed and a sleeping couch which we can convert into a single bed or double bed. You have a dining bar, which sit 2/3 adults and a design rocking chair. Candles for a romantic touch are everywhere in Rosies Place. Of course you have free WiFi. The kitchen is fully equipped, beside the dishwasher (really important), two induction hobs, fridge, microwave, you will find coffee, tea, milk, sugar, oil and herbs. If you want we can provide breakfast at any time in the morning. Just let us know. The bathroom has a big rain and hand shower. Towels, soap and shampoo are provided for you. If you need clean towels just drop them outside in the washing bin and you will have clean ones within a day. The terrace has SUN ! What else can we say. Sun in the morning for your coffee, sun during your lunch, sun in the afternoon drinking your beer or wine. But he it’s Holland so keep your fingers crossed that the sun will shine! Please note that Rosies Place is a none smoking studio. You can smoke normal cigarettes outside on the terrace. Also we do not allow any form of drugs on our premises.